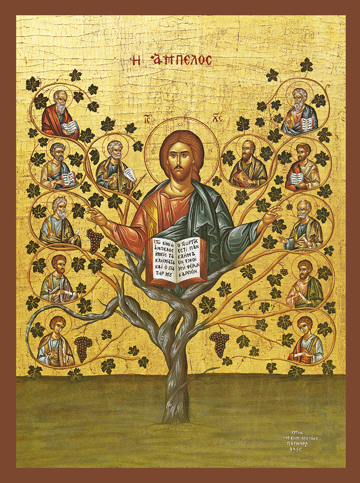 In this unusual icon we see that Christ is the Tree of Life and the Apostles are the branches that went out to preach the Word to the ends of the earth. Jesus Himself said, “I am the true vine and ye are the branches.” (John 15:5) The Lord’s arms are outstretched as He gives the blessing as a bishop in the Orthodox Church with the fingers of both hands forming the the Greek letters “IC XC” which is an abbreviation for Jesus Christ. In His lap is an open Gospel Book and in His halo are the Greek letters of the words “I AM” to remind us that He is God, the groundwork of Existence Itself, and the Root of All Life and the Source of All Faith. On either side of His Divine Face are the Leaders of the Apostles Peter (on the left) and Paul (on the right) and further out five more of the Holy Apostles on either side. The Evangelists hold their open Gospel Books, while the others hold Epistles and bless all with the Name of Jesus. There are many false doctrines and empty promises that tell us of a blessed life with easy salvation, but only Christ is the True Vine bringing us life in Him– Life Eternal. May we choose that narrow but lovely path: Jesus Christ crucified!